Founded in 2012 and located in Northport, Michigan, a small village bordering Lake Michigan on the Leelanau Peninsula, Idyll Farms is comprised of 200 acres of rolling hills, including a farm and creamery that produce goat’s milk cheese from certified-humane, Alpine goats. Due to its proximity to Lake Michigan, Idyll Farms enjoys abundant sunshine, snow, and rain throughout the year. Combined with the richness of the soils – enhanced by the addition of organic compost, beneficial worms, and probiotic whey from cheesemaking – the farm’s pastures yield lush grasses, leaves, brush, and wildflowers, which reveal them themselves in this unique “taste of place,” the Leelanau Peninsula terroir flavors of the farm’s goat’s milk and cheese. Like the name suggests, Idyll Farms is just that: idyllic. This beautiful farm takes great care of their 100% pasture-fed flock. For example, the farm practices rotational grazing. This sustainable form of grazing, in which a pasture is divided into smaller sections and goats rotate from one section to another with fresh grass, is ideal for both the pastures and goats. Idyll’s goats, which each produce about one gallon of milk per day, are milked twice daily in the milking parlor using a gentle, low-lying, vacuum system, then the milk is pumped directly into the nearby tank room and vat pasteurizer. The result is cleaner, fresher milk for cheesemaking. Idyll Farms’ cheesemaking team flips, washes and cares for each cheese in state-of-the art, cheese affinage caves, which maintain the optimal temperature and humidity for each type of cheese. When aging is complete, the cheeses are wrapped in special paper to ensure they arrive in perfect condition at your door. 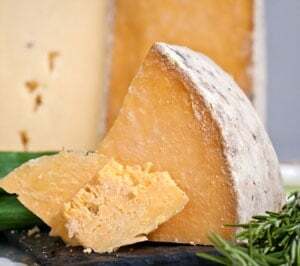 This month’s selection, Idyllweiss, a 2015 and 2017 American Cheese Society award winning cheese made with a touch of organic cow cream, reflects the fresh, clean flavors of this farm’s splendid pastures and onsite, daily milking and attentive cheesemaking. 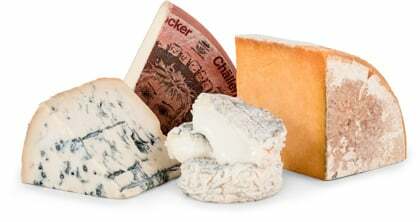 We thought that Idyllweiss would be a welcome contrast to the other two cheeses in this month's selection. While the other two are extra-aged, big flavor cheeses, Idyllweiss is smaller, softer, and more delicate. It is a bloomy rind cheese with a wrinkly rind and white paste. The cream line, just under the rind, ages from the outside in and becomes increasingly creamy as it ages. The paste is soft and buttery, a veritable melt-in-your-mouth cheese. Enjoy with this cheese with higher-acid white wines like Riesling, Sauvignon Blanc, and Vouvray; a sparkling wine like Champagne or Crémant de Bourgogne; or red wines with bright, red-fruit characteristics like Cabernet Franc, Grenache, or Pinot Noir. Both savory and sweet food pairings will complement Idyllweiss: think salty, cured meats like pancetta and prosciutto, or sweet accompaniments such as honey and dried fruits. It is also delicious with a fresh or dried fruit chutney, pepper jam or jelly, and tart marmalade.